I find myself missing Newfoundland. It may be because I had more of a social life during my one year in Newfoundland than I have ever had, but I think it also has to do with geography. 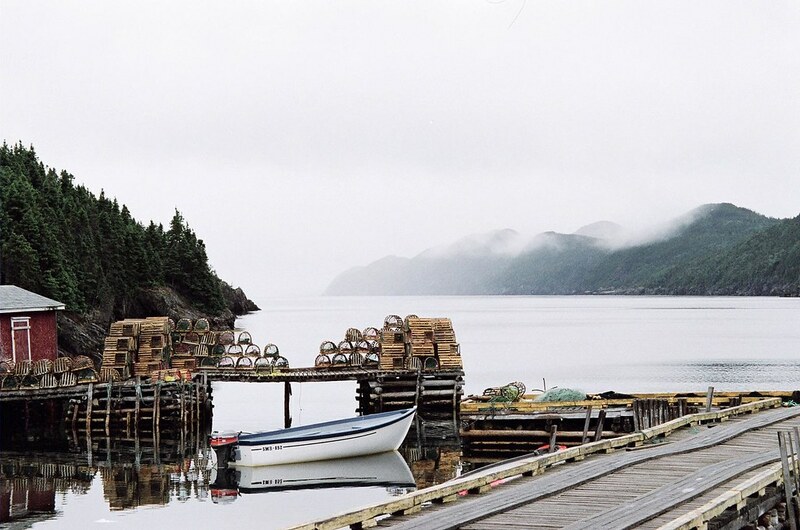 Newfoundland, to me, was endlessly fascinating. It seems around every corner there was something beautiful to look at, something intriguing to the eye, something that made you feel as though you were on a whole different planet - or at the very least in a different country than the rest of Canada (in the past you would have been!). Newfoundland is full of rocks. I suppose a lot of people would not find that interesting - The Rock does not exactly evoke thoughts of beauty and intrigue. Newfoundland, however, is full of so many different kinds of rocks: Fields and fields, hills and hills, of small grey rocks of all different sizes, building blocks of red rock that trickle water into the sea, huge cliffs of steep stone that keep you far from the waves that crash against the abrupt shore. There are flat bits of Newfoundland too - flat bits that suddenly stop in front of ancient mountain chains and flat bits that make you feel alone in the world, but in a marvelously wonderful way. Newfoundland is a postcard in the winter. It only seems to snow in blizzards, but afterwards you are left with the winter world of your childhood dreams and warm temperatures to enjoy it all. I've always prided myself on my appreciation for geographical beauty. Even places that other people don't find at all stunning, I've always been able to appreciate the hidden beauty of it all. The certain way things do or do not catch the eye is intriguing to me. The more I travel though, the more I have to admit that I've begun to find Eastern and Southern Ontario (mostly Southern Ontario) amazingly dull. The flat farmer's fields that once caught my eye as a kid, now just seem not flat enough to be as interesting as the prairies and not hilly enough to be as beautiful as western New Brunswick. Ontario can be beautiful though, but it has to do with weather. One of the reasons I'm missing Newfoundland so much is because it's horribly hot and muggy here. The heat is tangible and oppressive. I miss Newfoundland's constant ocean breeze. I miss the fact that it never got too hot in the summer and the winters never got cold. When I was in Newfoundland though, I missed the one thing Ontario has that Newfoundland doesn't: Thunderstorms. There's nothing more beautiful than a good thunderstorm. The build up with days and days of oppressive heat, short tempers, and inescapable climate induced depression is almost worth it when a real thunderstorm breaks. I love the anticipation of it all - the increased wind, the dark clouds on the horizon, the sudden feeling like you should be running for cover. A good thunderstorm breaks the barometric pressure - in scientific terms I guess, anyway. What I mean is, a good thunderstorm makes you feel like you are flying - you can do anything and go anywhere. In the pauses between lightening and thunderclaps, the world belongs to you - it's horribly violent and unpredictable - but it's yours and you love it. In the rain green is greener and black is blacker and life is worth living. When I complain of being bored, which I do quite often, people often tell me that it is considered a curse in China to wish someone an interesting life. I suppose they are trying to tell me that I should be thankful that life is boring, but I don't think they realise that I'm a thunderstorm on the inside - If life gets too boring, than I'm not doing my job.